Lagos sometimes referred to as Lagos State to distinguish it from Lagos Metropolitan Area, is a state located in the south-western geopolitical zone of Nigeria. It is the smallest state by geographical size in Nigeria. It is arguably the most economically important state of the country, containing Lagos (as a city), and the nation's largest urban area. It is a major financial center and would be the fifth largest economy in Africa if it were a country. According to the World Population Review, Lagos State is the second most populated State in Nigeria after Kano State with approximately 17.5 million people living in it. It has twenty local government areas and various sub-cities and towns within. Most of these cities and towns are commercial areas that give the state the leverage of being the leading economy of the country. Major of these commercial cities and towns are Lagos Metropolitan Area, Ikeja, Lekki, Ikorodu, Eko-Atlantic, Badagry, Epe and Ojo and etc. 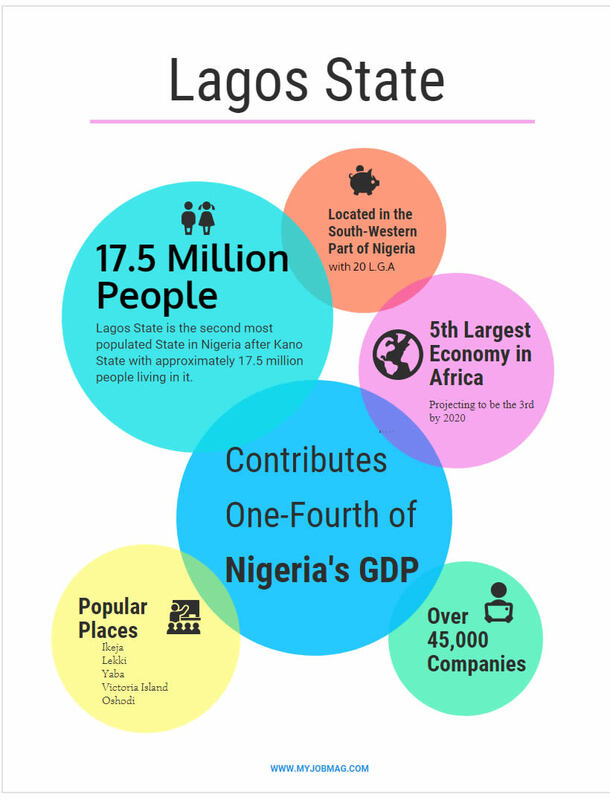 The State is Nigeria’s economic focal point, generating a significant portion of the country’s GDP (a quarter). Most commercial and financial businesses are carried out in the central business district situated on the island. This is also where most of the country’s commercial banks, financial institutions, and major corporations are headquartered. 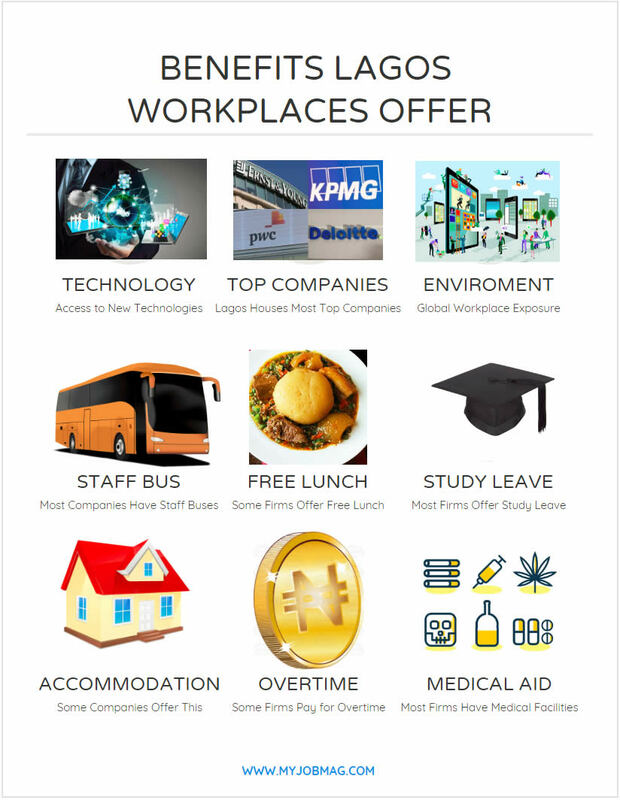 These and more are some of the various reasons why many people would want to work in Lagos. In understanding the state properly and most of the insights to be shared below, it’s important to first understand the state’s geographical categorization. 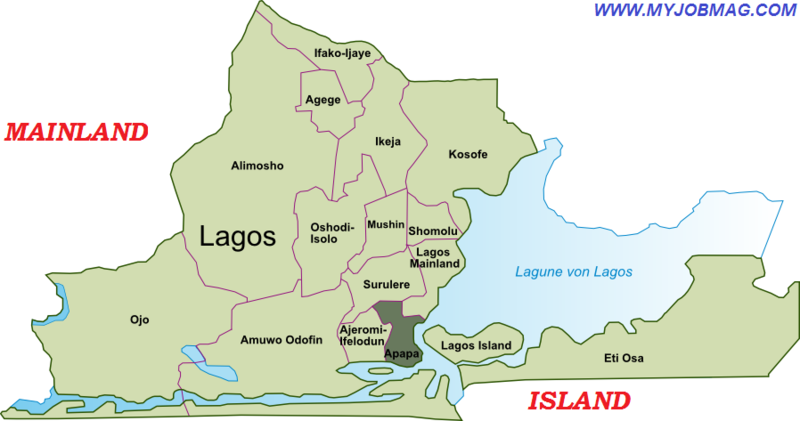 It is often categorized into two; Lagos Mainland and Lagos Island. Generally, an Island simply means a piece of land surrounded by water. The Island of Lagos does not take exemption to this definition. The Lagos Island is a loose geographical term that is used to define the area of Lagos which is separated from the "mainland" by the main channel draining the lagoon into the Atlantic Ocean. The popular boundary of the island and mainland is what the average man in Lagos knows as “Third Mainland Bridge”. It is where the people living on the island come through to the mainland and thus serving as the major separation between the two places. Lagos Island contains the central business district. It is characterized by high-rise buildings. The island also contains many of the city’s largest wholesale marketplaces (such as the popular Idumota and Balogun markets). It also consists of major places like Lekki, Victoria Island, and Ikoyi. The Island fits as the best place to live in Lagos especially because of the proximity between the place of residence and place of work. However, the cost of living on the Island is high. Most of the multinational companies in Lagos and even Nigeria have their headquarters situated in Victoria Island, Lekki or Ikoyi. The sub islands are separated from each other by creeks of varying sizes and are connected to the main Lagos-Island by bridges. The smaller sections of some creeks have been sand filled and built over time. A huge population of Lagosians live on the mainland, and most industries are also located there. The mainland is known for its commercial and entrepreneurial activities. Mainland areas include Surulere, Yaba, Agege, Apapa, Mushin, Oshodi-Isolo and Ikeja (site of Murtala Muhammed International Airport and the capital of Lagos State). Below is a collection of activities of what it looks like working in Lagos. Let’s explore together. The term cost of living, is the amount of money needed to sustain a certain level of livelihood, such as housing, food, health care and some other basic and frequent expenses. Cost of living is often used to compare how expensive it is to live in one city versus another. Lagos State has one of the highest cost of living in Nigeria. 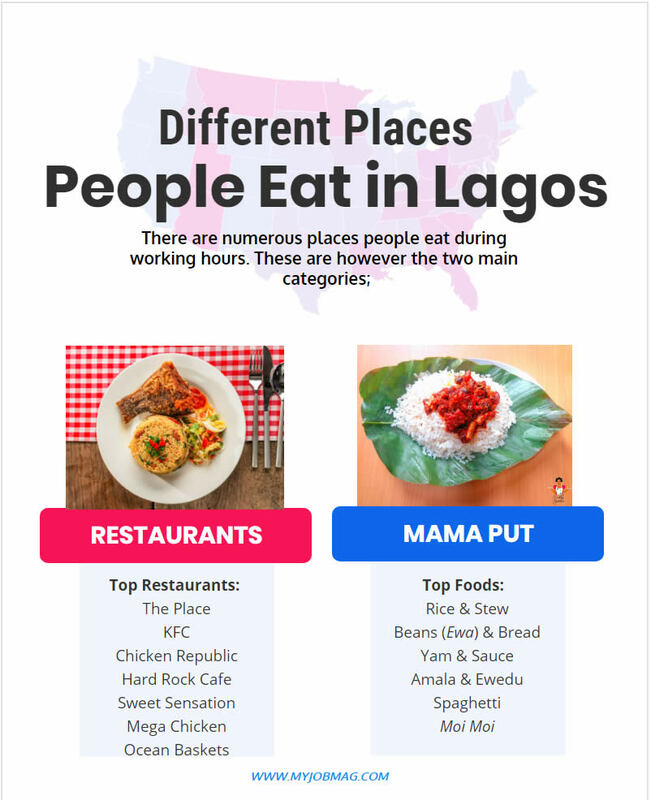 In this article, we will be focusing on three of the most common expenses, Accommodation, Feeding, and Transportation and then comparing Lagos State with other states of Nigeria. Apartments for sale in Nigeria differs in terms of the types and the prices and also accomodation. As regarding the types, there are various categories of accommodation that are available for those who intend to work or live in Lagos. The most popular of them being Self-Contained, Mini Flat, Bedrooms Flats, and etc. Each of these also differs in terms of their prices which is based on locations. For example, houses in the island are generally more expensive than those in the mainland. A self-contained apartment is a single room that has all the facilities such as toilet, bathroom and most probably a kitchen en-suite in it. Based on data in ToLet.NG, a leading real estate agency in Nigeria, the average amount of a self-contained apartment in Lagos costs #300,000 per year. Where some are as low as #60,000 per year in the mainland and others are as high as #500,000 in some parts of the Island. A mini-flat is an apartment that consists of one bedroom, a sitting room, kitchen, bathroom, and toilet. A mini-flat is akin to a typical "room and parlour". The average amount of a one-bedroom mini flat apartment in Lagos costs #500,000 per year. Where some are as low as #150,000 per year in the mainland and others are as high as #1,300,000 in some parts of the Island. Generally, flats are more expensive and could have different numbers of rooms in them, some up-to 6-bedrooms. However, the most popular of them are the two and three bed-room flats. The average amount of a two-bedroom flat apartment in Lagos costs #800,000 per year. Where some are as low as #250,000 per year in the mainland and others are as high as #4,000,000 in some parts of the Island. While the average amount of a three-bedroom flat apartment in Lagos costs #1,000,000 per year. Where some are as low as #350,000 per year in the mainland and others are as high as #8,000,000 in some parts of the Island. Food is the most important of all the basic human necessities of life. Without it, one cannot effectively function or operate at peak performance while working. Feeding in Lagos State is one of the highest cost of living expense which is usually spent at work. While some individuals may find it easy to take breakfast before leaving and even take lunch along to work, this is almost impossible for some other individuals (especially those who work far). Some firms in Lagos have it as part of their policies to give out lunch to employees on a daily basis or some days of the week. Some other firms make it customary to give free breakfast like tea or coffee. This is however untrue for most other firms in Lagos. Feeding, whether breakfast or lunch is the seen as the sole responsibility of the employees. On the average, lunch in Lagos costs #500 per meal. There are also various options of places to eat which also determines the prices. Employees who tend to eat in fast foods (eateries) may spend up-to #1,500 per meal while those who eat in roadside restaurants (popularly called mama put) may spend as low as #200 per meal. There also exists a variety of options for delivery. Going to the location in person, ordering via phone call or online order. Transportation is also one of the major factors that must be put into consideration before deciding to work in any location, especially Lagos. Lagos becomes very peculiar due to the distance between most place of work and the place of residence. In Lagos where accommodation in the island is very expensive, most of the employees tend to live in the mainland which is very far. Some go as far leaving home by 5am to return back by 10pm. The stress and all can sometimes lead to job dissatisfaction. That is why it must be duly considered. In terms of the transportation costs using the example of an individual living on the mainland and working on the island, cost of transportation per day can go as far as #1,000 to #1,500. Even for those leaving and working around the same area, transportation cost can still go as much as #300 to #500 daily. A very important attribute to take note of Lagos transportation is the “Traffic”. Lagos traffic is so bad that it is said to be the fourth city with the worst traffic in Africa. Traffic is thus part of the core attribute commuters must take into consideration while considering a means of Transportation. However, with the innovations brought in by various online platforms in Nigeria, an individual can easily escape some routes with huge traffic by following prior details giving to them. Leading in this line is an online platform called GidiTraffic, where it uses a Twitter hash tag in achieving this. It is very popular and thus serves as a source of information for most commuters in the state. Many other radio stations make it a duty to also inform people of traffic situation from 5pm. Unlike the vast majority of other states in Nigeria, Lagos is known to have a very competitive salary structure. Generally, the salary structure of most firms in the state could range from base salary, cash bonuses, accommodation, sales commission and even profit sharing. We will focus on the prevalent ones. Base salary is a fixed amount of money paid to an employee by an employer in return for work performed. Base salary does not include benefits, bonuses or any other potential compensation from an employer. It is paid, most frequently, in a monthly paycheck to a worker or professional employee. According to Nigerian’s number one salary database MySalaryScale, the average salary of workers in Lagos state as at the time of this article stands at #150,000 monthly. The state has the highest average salary among the other 35 states of the country and the FCT. According to this platform, some workers in Lagos State earn as much as #1,500,000 monthly while some others earn as low as even #7,000. The salary variations is based on so many factors such as company, industry, years of experience, academic qualification, associated risk and etc. A cash bonus is a lump sum (small amount) of money awarded to an employee, either occasionally or periodically, for good performance. A cash bonus for better-than-expected performance may be awarded to an individual, division or the entire organization, depending on the level at which performance targets were exceeded. Companies in Lagos do not take exemptions to this. Most firms however, make it customary to give it periodically often to crown the end of the year. The average Cash Bonus of an employee in Lagos State stands at #25,000 which is often than not paid per annum. Some firm however, pay far much, some less and a few others not at all. Due to the high cost of accommodation in the state, some employers make it customary to provide their staff or potential employees with accommodation to ease the stress attributed to working in a far distance place. This is however true for only a few firms and is usually common for those in the technology and sales sectors. Some other corporate organization however, go as far as inculcating the accommodation expenses as part of the employees’ benefits and pay them at the end of the year or whenever it’s due. A 13th month salary is a form of monetary benefit equivalent to the monthly basic compensation received by an employee, computed according to the number of months within a year that the employee has rendered service to the employer. This is obtainable in some corporate firms as well in Lagos. The strength of Lagos lies in providing opportunities to all who come in contact with her. Lagos is a place of unlimited opportunities, especially as it relates to the concepts of jobs, working or money-making. According to the Nigerian Bureau of Statistics in December 2017, the unemployment rate of the country based on its revised methodology was calculated to be 18.8% in the third quarter of 2017. Under-employment rates also increased gradually over the past three quarters and the rate in Q3 was reported as 21.2%. With Lagos state housing about 10% of the total Labour force of the country, it thus gives an insight of the unemployment rate in the state also. However, dense population is profitable for industrial cities, Lagos being a typical one. Over 50% of jobs advertisement posted daily in Nigeria is situated in Lagos State only. Thus, even though the unemployment rate of the country is high, a large chunk of the job availability is still situated in one state – Lagos. Using our platform (MyJobMag) gives you a first-hand eye view of various job vacancies advertised in the country and the state specifically. There is also a tool that can aid job-seekers in Nigeria to ascertaining the authenticity of job vacancies. Individuals can easily check the CAC database to ascertain if a company is registered in Nigeria when not totally sure of a particular job vacancy. If the authenticity of job vacancy has been ascertained, locating the venue of the firm for an interview or application can be difficult for new Lagosians too (popularly called JJCs) and sometimes for even old individuals. Thus, an easy way to locate a company even if you have no idea of the place, is to simply enter the address on InstantStreetView. Here, you get the image of the firm in clear view and even get a glance of other buildings in the street. This eventually makes it easy in locating any place in Lagos. Professional Driving Jobs with Uber and Taxify and etc. With the massive number of companies and start-up in Lagos, it makes it easier for employees to move from job to jobs thereby giving them an opportunity to improve in their career. This is unlike some other states in the country, where there are lesser jobs and makes it more difficult for people to move from company to company or jobs to jobs thereby reducing the rate of career growth. Among the various attributes that make Lagos state what it is, entrepreneurship is probably among the topmost. Hundred thousand of individuals every day uses entrepreneurship as their sole means of livelihood. People sell anything in Lagos, anything at all - products, services, ideas and can even sell ice to an eskimo. Most start-ups in the country also have Lagos state as their place of launch before extending to other states of the country. Among the various needs necessary by entrepreneurs to excel in their daily endeavor is a workspace. These workspaces are provided by various hubs in Lagos. The days of struggling to rent, or build one’s own traditional office before starting a business are dying fast. Indeed, availability of co-working spaces has made it possible for many small and medium businesses to kick off and run efficiently. Asides the workspace offered, other basic needs such as electricity and internet are often inclusive of their pay packages. Needless to say, the benefits of co-working spaces cannot be over-emphasized. This could be a pointer to why most incubation hubs in Nigeria also offer co-working spaces as part of their incubation plans. Deskyard (Lekki) - Ranges from #4,000 to #45,000 monthly. Capital Square (Lekki/Ikoyi) - Ranges from #3,000 per day to #100,000 per month. Cre8 Space (Victoria Island) - starts at #5,000/day to #20, 000/week and so on. WorkStation (Victoria Island) - starting at # 5000/day; #15,000 - #50,000/month; and #100,000 (Starting) for Private Offices. Seedspace (Ikoyi) - Membership ranges from #10,000 to #50,000 per month. ReDahlia (Ikeja) - #35,000 (for open space) to #150,000 (for serviced offices) per month. TPX Hub (Ikeja) - Ranges from #1,500 per day to N110,000 per month. The Colony (Ikeja) - Membership ranges from #10,000 upwards. African Hub (Ikeja) - Starting at #20,000 per month. The Circumference (Surulere) - #30,000 per month for shared space (exclusive of VAT). #10,000 for registration. The Village (Yaba) - Ranges from #10, 000 to #150,000 per month depending on subscription choice. Leadspace (Yaba) - Ranges from #2,500 per day, #40,000 per month and #100,000 per year. LitCaf (Yaba) - Plans go from #1,800/day to #70,000 per month. Silver Ark (Yaba) - Ranges from #1,500 daily to #216,000 yearly, depending on the package subscribed to. Lagos is a fast-paced environment and considered as the fastest growing city in Africa, where hustling and bustling is the typical order of the day. The lifestyle and events in the state take after the order of the environmental nature, where things are very unusual from what is obtainable in other states of the countries. Some of the lifestyles and events to be discussed here include, hangouts, nightlife, culture, art places, beaches, music and dancing schools, cinemas, library, universities, shopping malls, and etc. Tarkwa Bay (Victoria Island) and etc. National Open University (Victoria Island) and etc. The exposure an employee gets working for various firms differ from state to state. This is also true for the working environments. With the rapid increase of virtually all commercial activities geared towards technology, most graduates are probably looking forward to working in firms with enough exposure on IT. As an industrial state, Lagos houses various sky-scrapping firms and huge conglomerates in the country with lots of industry knowledge to learn from and daily commercial activities to wet one’s career appetite with. In terms of the top companies to work in Nigeria, Lagos is probably the headquarters for most. Thus, the state is one of the best places to work in Nigeria when considering exposures and working environment in terms of aesthetics and prestige has it has lots of big companies with a well-designed workspace. Lagos as a city is the heart of modern technology in Nigeria. In all fields of endeavor, new and innovative products or services are often time than not first explored here before it gets to other parts of the country. It thus, serves as a great place to learn new skills while working and also get the opportunity to come up with witty inventions or ideas via the exposure it offers. So when looking at working in technological-driven firms in the country, Lagos is definitely the first place to consider. As the technological exposure it gives, is second to none in the country. Lagos has prestige, no doubt about that. It’s one of the states that most potential employees consider first to work in when focusing on status. After leaving the University, most graduates probably want a white-collar job with lots of prestige attached. Lagos is just the perfect place for this. Employee benefits in kind also called fringe benefits, perquisites, or perks include various types of non-wage compensation provided to employees in addition to their normal wages or salaries. This ranges from provision of buses for transportation, free lunch, free internet data during office hours, medical care facilities, and various forms of leave. Due to the long distance between the residence of most employees to their workplace, and the stress faced by most of them while commuting there, most firms make it as part of their policies to get staff busses for the employees to various routes. This is common in Lagos and most companies do have staff busses that pick up their employees and drop them back at home or at bus-stop closest to them. Benefits of staff bus include reduction in stress leading to increasing productivity, punctuality and cost savings for the employees. Some Lagos State employees also enjoy free lunch in their firms. While this is daily and constant for some firms, it is however rare and intermittent for some other firms. It’s also important to mention that it is almost not attainable in some firms as those employers see feeding in general as the sole responsibility of the employees. With the rapid increase in technology, virtually every firm in Lagos now has a Wi-Fi system for its company that allows the employees to carry out their IT activities smoothly. This also allows the employees free access to internet data for their other personal devices thereby saving cost. This is frequent in the state. Working in most firms in Lagos also gives the benefit of medical care facilities where one can treat his or herself when under the weather during working hours. In cases where an employee may be seriously sick and the workplace medical facility becomes insufficient, some employers would offer the employee a sick-leave to take proper care of his or her self. Here, the employee is paid his or her complete salary still irrespective of the number of days missed. A leave of absence is a period of time that one must be away from one's primary job while maintaining the status of an employee. There are various types of leave or time off work to which employees may be entitled. These include annual leave, public holidays, sick leave, maternity leave, paternity leave and etc. There are also times when one may require leave or time off work for specific reasons. This could be when one has a family crisis, or if one wishes to take study leave or a career break. In some cases, individuals are entitled to paid leave but in others, you may not. Like every other state, firms in Lagos takes its holiday seriously, and employees are entitled to overtime if they work during public holidays. As regards maternity leave, Lagos State Government has approved 10 days paternity leave for any male civil servant in the state whose wife delivers a new baby. Female officers are entitled to 24 weeks maternity leave with full pay in case of her first two deliveries and this commences, at least, two weeks before the expected delivery date. The length of this leave varies slightly for private companies. As regards annual leave, most organization employees are entitled to any of the following lengths of paid leave; some are entitled to a 14-day leave, some 21-day leave and a few others 28-day leave. This depends on their years in the organization or level of staff they are. Work overtime is simply the time spent working at one's job in addition to one's normal working hours. The official time for normal government officials in Lagos state is 8am to 4pm. Except for those in the health sector or other fields where night or work shift is required. The official time for most private organization in the state is 8am to 5pm, where some work till 6 or even 7pm depending on the nature of the job. Any extra time spent working in addition to one’s normal work is tantamount to an overtime. Where the worker is supposed to be entitled to an overtime pay. However, this is rarely the case for most firms in the state, though some take exception to this. Working in Lagos unlike some other states in Nigeria may require the individuals to stay a little beyond their usual closing time without entitlement to an overtime. This is almost usual for most private firms in Lagos. Thus, when planning to work in the state, it is only a norm to expect to add at least a fifteen-minute or thirty-minute extra time as demand calls after the actual closing time. With the insights shared above, one can easily conclude that Lagos State is indeed a great place to work and even live. As reiterated over and again, the state has lots of benefits that accompanies working or living therein, unlike most other states in the country. This does not however negate the fact that it can also be very tiresome and thus disadvantageous for individuals who love slow-paced environment. However, with the concept of cost-benefit analysis, to a large extent one may come to conclusion that the state has more benefits to the employees, entrepreneurs and her business owners than the costs of living in it. Èkó ò ní bàjé oooooo!